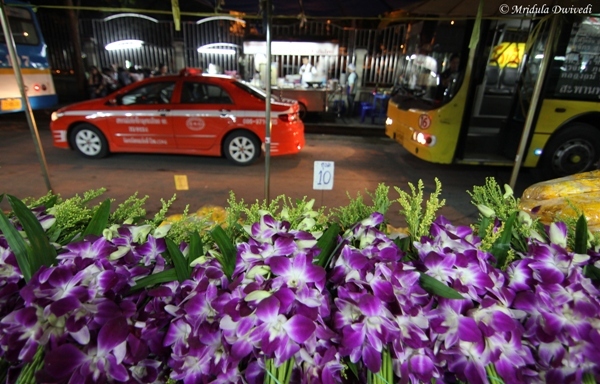 Pak Khlong Talat is Bangkok’s biggest flower market. 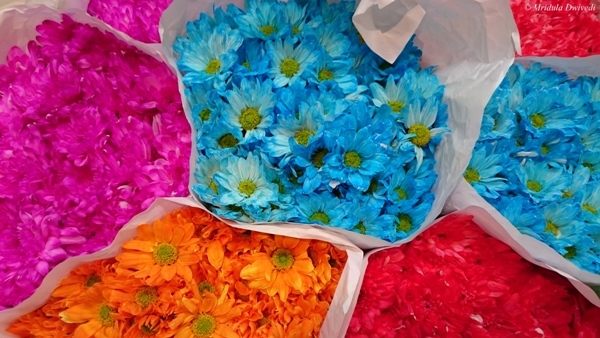 It is a riot of colors, the fragrances float through the street and it is a photographer’s delight. I visited the market at night. The shots are taken with XperiaZ3 or Canon550D. 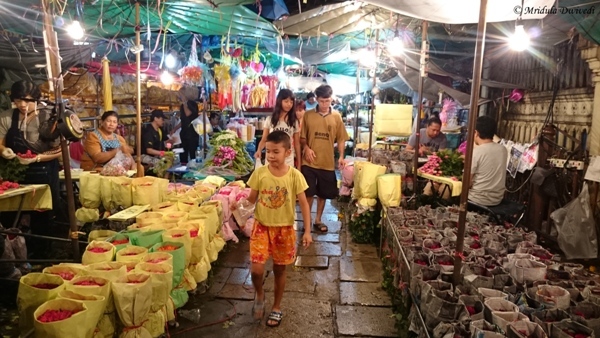 The market is located on the Chak Phet Road and it is a 24 hour market! The stalls are on both the sides of the street. After a while I was so engrossed in flowers and the scents that I completely forgot the traffic. 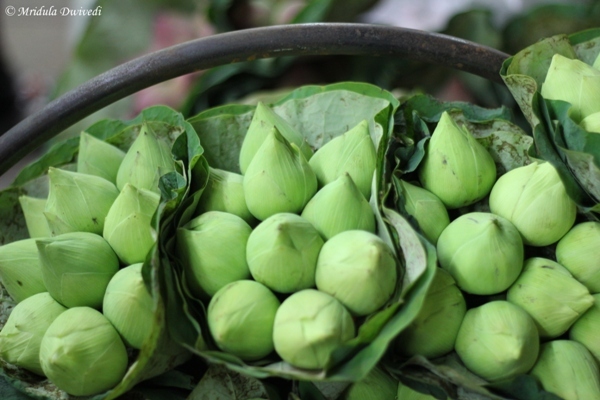 Lotus grows very commonly across Thailand. I have seen it growing in water pots, in tanks, in water bodies, literally growing like weeds! It is also offered at all Buddhist temples. Almost every hotel will have some lotus arrangement on its premises. 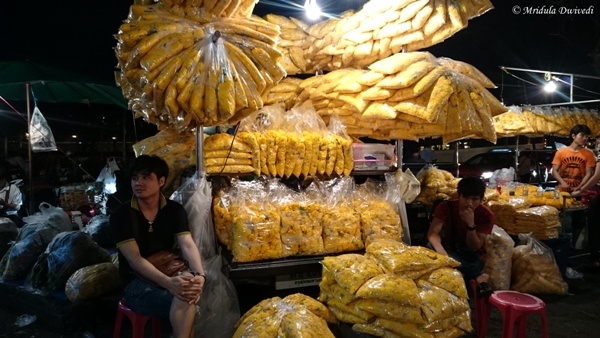 Pak Khlong Talat is both a wholesale and retail market. Even at night the business was brisk. The customers were mostly locals. You could find an odd awestruck tourist like me going crazy with taking pictures, but mostly it were the locals who were buying the flowers for their homes, as gifts or as offerings. Jasmine, crown flower and marigold scents got mixed in the air and they completely overpowered any traffic fumes that tried to stay put and struggle with the flowers. 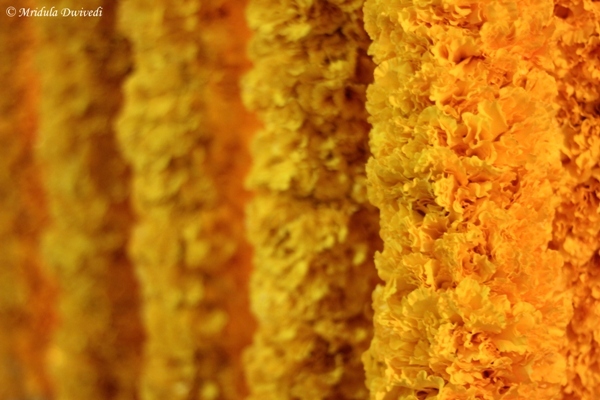 Marigolds were sold in huge numbers. There were whole pickup trucks decked in marigold. When I pointed my cell phone at the boy he nodded yes and like a pro looked away from the camera! As I am quite a big fan of clicking screen full of stuff I absolutely went berserk doing just that. 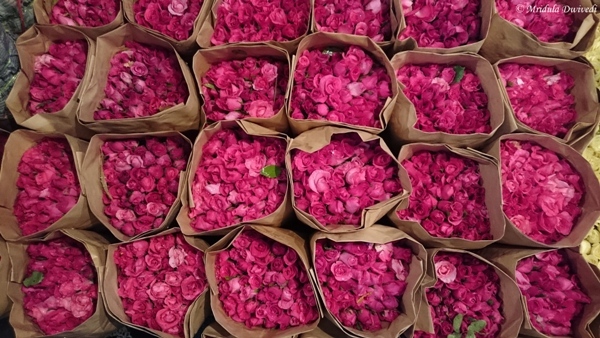 There were these fat bunch of roses piled up in rows. And they came in many colors too. As this is a wholesale market, the prices were mouthwatering as well. 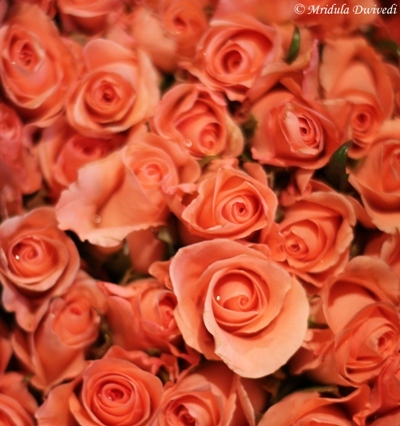 A big bunch of roses was priced at 100 Baht (200 rupees) and the bunch surely had more than 50 flowers! 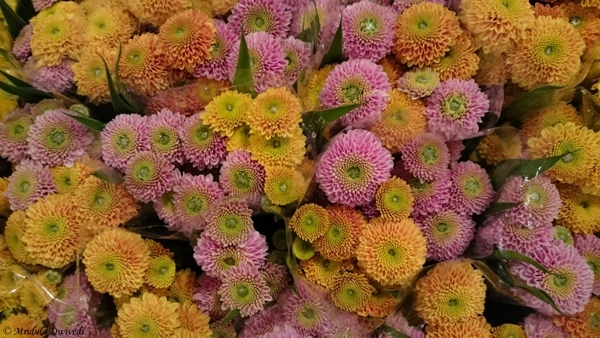 Smaller bunches of different flowers were available for 10 or 20 Baht as well. As the walking path was narrow, it was quite easy for me to get entangled into others feet, as I was not willing to look away from my camera! But an average person in Thailand is very polite and they tolerated me with a lot of patience! Not a single shop owner ever objected to my picture taking frenzy! My guide was a little puzzled as to why was I taking so many pictures? I told him I took so many because I was not sure of which one would come out well! When I showed him this picture he also took out his phone and clicked one! Even after walking through both the sides, I was quite reluctant to go back to the hotel. But then it was already late in the night and I had to drag myself back to the car just after one round. 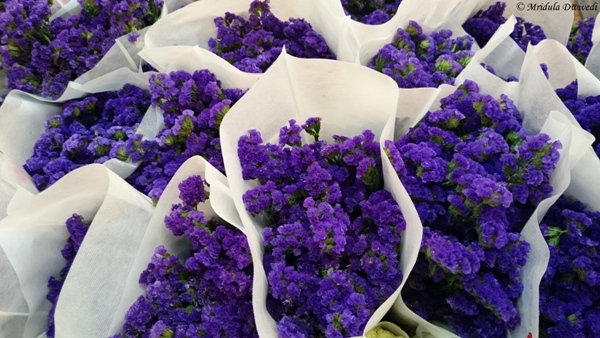 Whenever I head back to Bangkok, I would try to go back to the Pak Khlong Talat flower market again! I was invited by TAT New Delhi to Visit Thailand and I am indeed thankful for the opportunity to visit Thailand again! My new phone is a Sony Xperia Z3. It took me a while to start using it as it would take a nano sim whereas I had a micro sim. But that is sorted now through the collective wisdom of my friends on Facebook. So here is what I have to say about the phone. Mom Look I can Multitask too! 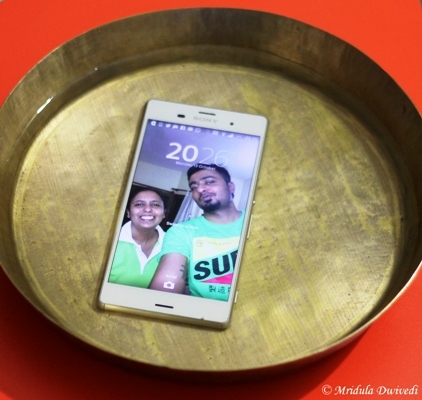 Look and Feel: Sony Xperia Z3 is the biggest phone in size that I have used till date. And yet it is comfortable to hold. The surfaces are smooth and yet I never got a feeling that it would slip out of my hands. I have the white color phone and it looks elegant. Camera: I don’t know when it happened but gradually for me the most important feature of a cell phone became its camera! There was a time when I used to carry a point and shoot for taking quick pictures but I now do it with my phone. Xperia Z3 has a 20.7 megapixel camera which in my opinion is quite adequate, after all I do not blow up my pictures in large sizes, say for a hoarding. As of now I have not used it as much as I would like but I have noticed a nice thing about it. I usually click pictures of my daughter who doesn’t like to stand still for a single second! The camera somehow manages to freeze Chhavi in motion and that in my opinion is quite an incredible task! The phone has inbuilt camera apps like panorama, including yourself in a shot called ‘Face In’ etc but I have to try it out. The colors come out quite well and I can bump up the ISO up to 12800! Now that sounds quite incredible. I have yet to make a video with the phone but I will upload one soon. Notice the word fresh water. In spite of having the phone in my hand I have been unwilling to try this feature! After all who takes their incredibly slim looking phones into water? Not me, at least not till now. Maybe I should give it to Chhavi (after making sure all the ports are closed) she will dunk it in water without any qualms! I am still gathering courage to take it to water. Now I Never Thought I could Chuck a Phone Underwater! OK in the end I did put it in water! That hunk with me is my younger nephew who gave me the playstation gyan. 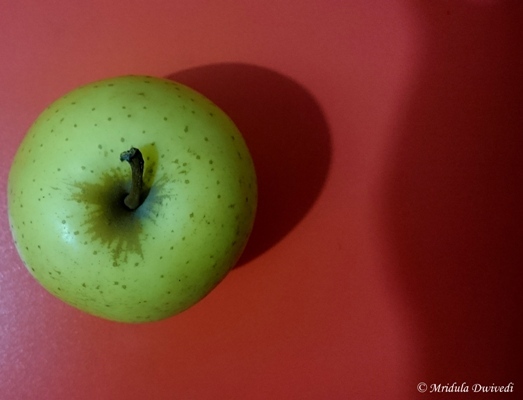 And here is a green apple that I clicked with it after taking it out from the water! Well, well I need to get used to this fact that my phone does not fear water. I need to remember the 30 minutes limit though. 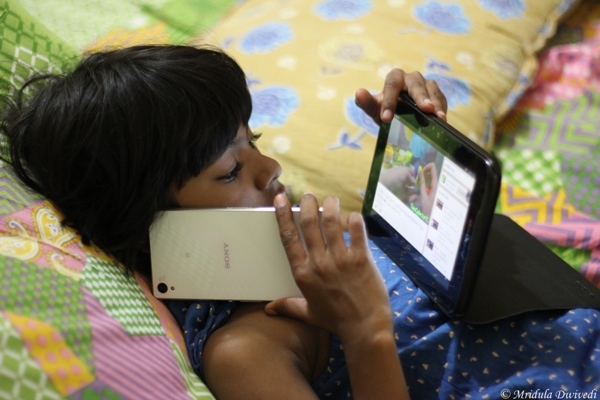 Sync with Your Play Station: Mobile phones are a communal affair in my home. While my nephew was playing with it, he excitedly told me he could use his play station with it. I would never figure it out on my own. Apps: As it is an android phone, the choice of apps is huge and the interfaces quite nice. Battery Life: For the few days that I have used it battery life seems quite good to me. But I will update on this after I take it out on a trip! This is how my first impression of the Sony XperiaZ3 stands. I will update you guys say after a month of use and see what further I have to say.